President Barack Obama attends a performance by native Alaskan dancers at Dillingham Middle School, in Dillingham, Alaska, Sept. 2, 2015. President Barack Obama Wednesday became the first sitting president to visit a community north of the U.S. Arctic Circle, as he wrapped up a three-day Alaska trip aimed at highlighting the effects of climate change. After meeting tribal leaders and fishermen in Dillingham, home to the world's largest sockeye salmon fishery, he went to a local school and joined children in Native American dress as they performed a traditional dance. Obama later heads into Kotzebue, an Arctic town of about 3,100 that is battling coastal erosion caused by rising seas. The president's highly choreographed trip across Alaska aims to build support for his environmental policies to combat climate change. Some U.S. lawmakers oppose those policies, saying the threat of climate change has been exaggerated. On Tuesday, the president used the backdrop of a rapidly melting Alaskan glacier to highlight the effects of climate change, as he continued his landmark visit to the far northwestern U.S. state. "This is as good a sign post of what we are dealing with, when it comes to climate change, than anything," Obama said, standing in front of the Exit Glacier, which has receded two kilometers over the last two centuries. Climate change has resulted in winters with less snow and hotter summers, melting polar ice and raising sea levels, Obama said. "It sends a message about the urgency we are going to need to have when it comes to dealing with this," he added. 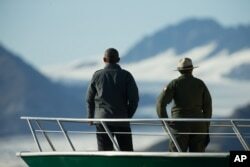 The president took a scenic boat tour in Resurrection Bay in Alaska's Kenai Peninsula. He also filmed a filmed a segment with reality television host and survivalist Bear Grylls. Obama's trip has not only highlighted concerns over global warming, security and energy, but issues of shipping, mineral exploration and fishing. All are intertwined, and each is of vital global interest. President Obama is urging the U.S. Congress to approve a faster track for building a new heavy icebreaker, moving its completion date from 2022 to 2020. With melting ice in the Arctic, the need for the new vessel might seem contradictory; but, as the Arctic waters become more accessible for trade routes and drilling for oil and natural gas, far more ship traffic could be at risk, with shifting climate conditions leading to unpredictable freezing seas. The Arctic seabed may hold nearly a quarter of the world's untapped oil and gas. The heavy icebreakers are costly, with a $1 billion price tag; but, the United States is down to just two of them, falling far behind Russia, which has 40. Michael O'Hanlon, senior fellow at The Brookings Institution and a national security expert, said there has been a growing discussion about this subject. "Whether we are essentially ceding the Arctic to Russia, and exactly what that means, of course, can be debated. What it boils down to is that if something is within 200 miles (320 kilometers) of your coastline, it's yours for economic purposes," he said. "You also can debate whether something is yours if it's beyond that - should it be seen as part of the logical geographical continuation of the continental shelf? And I believe Russia is trying to involve that for some of its claims right now." "We desperately need a forum to discuss these emerging security issues," said Heather Conley, director of the Europe Program at the Washington-based Center for Strategic and International Studies. As he began his visit to Alaska Monday, President Obama declared climate change to be the defining threat of this century. At a State Department-sponsored summit on Arctic environmental issues in Anchorage, he said the world is "not acting fast enough" to address climate change. "On this issue of all issues, there is such a thing as being too late,'' Mr. Obama said. "And that moment is almost upon us." He said the Arctic "is the leading edge of climate change - our leading indicator of what the entire planet faces." He said Arctic temperatures are rising about twice as fast as the global average and that Alaska has warmed about twice as fast as the rest of the United States. He said last year was Alaska's warmest on record, just as it was for the rest of the world. Officials from the U.S., France, South Korea, Singapore and other countries announced their pledge in a joint statement, at the so-called GLACIER Conference. Delegates at the U.S.-sponsored conference have focused on the global implications of climate change. “We take seriously warnings by scientists,” the ministers said in their joint statement. The meeting in Alaska comes ahead of a U.N. conference on climate change later this year in Paris. President Obama has announced plans to make U.S. power plants cut carbon dioxide emissions by 32 percent below 2005 levels, while boosting the amount of power they generate using renewable resources.